The Quiet Site Glamping sometimes limits bookings to 3 or more days. 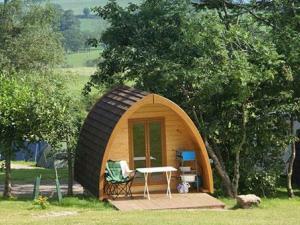 Camping Pods sometimes limits bookings to 3 or more days. Our new Hobbit Holes are large underground living spaces with an amazing view over the Ullswater valley. They are superbly insulated, energy efficient, secure and virtually invisible unless you know where to look … hobbits like to blend into the local scenery! They are four times larger than a standard Camping Pod and are therefore suitable for larger families or those wanting a little more in the way of space and facilities. Hobbit Holes sometimes limits bookings to 4 or more days. From M6 jct 40, A592 to Ullswater then Glenridding, turn right at Brackenrigg Inn, campsite on right.